Discussion in 'Networks & Internet Connectivity' started by beachBOYken, Apr 15, 2019 at 12:14 PM. I have an LG OLED tv that has an earlier version of firmware that I wish to stay on, I keep getting bugged by a prompt to update TV every time I turn the TV on. I'm aware that blocking the following is how to stop this prompt but I cannot seem to get my Asus ac86u to block them successfully. The above I have entered into my firewall url list but nothing is being blocked, these are defiantly the correct urls to block, so Im not sure what im doing wrong or perhaps my router can't do it. Can you post screen grabs showing what you've configured? Have you checked if they're blocked from another device? Maybe the TV already knows that it needs an update and isn't rechecking every time, does the message popup if you turn the TV on without an internet connection? Just putting lge in the list seems to work but it blocks all lg services on my TV which, I really just want the update prompt blocked. I will try the not having an internet connection next see if i still get the prompt. 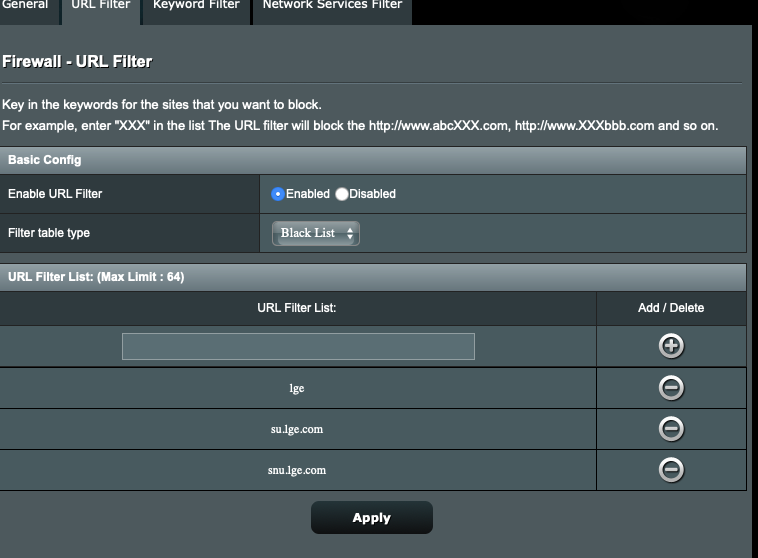 Does the Asus filter block https on the AC86u? I remember on the older models it could only do http. If the TV is using https that might explain why the block doesn't work. Not sure but seen this mentioned a few times, as said having "lge" in the list works but it blocks everything, update prompts, ads, updates for apps. So if that works it doesn't make sense, this is a work around but really I just want the update prompt blocked. Yes just tested it on my router, http is blocked but not https. But that's because I run the Merlin custom firmware, plus I love to tinker. It will be a https issue that the router cant do. Can I ask why you want to stay on a older firmware version on the OLED. Does it have parental control options? Could you use those to limit the TV's access to those sites? it was working before and now it doesn't as if lg changed the update servers addresses. Cheers both, I can see there are other ways but I'm not that technical minded, think I will leave it, I might get an apple tv 4k soon anyway so my LG will not need internet functionality then. LG B6 suffers from black glow which was introduced in 5.30.03 firmware and above, I have gone back and forth and tested it for myself and although minor in SDR it can be easily seen on fade to complete black screens in HDR in a pitch dark room. 4.31.25 firmware was the last firmware that did not have the issue, I wish to to stay on this firmware from now on. It's quite a big deal for many B6 owners, as its something LG broke themselves and have never fixed it. After all one of OLEDS big selling points is perfect blacks. It does, but last time I checked it looked quite basic in functionality. It looks like QoS was breaking it for me and after disabling it the TV doesn't nag about the update anymore. I do run standard and not Merlin firmware currently tho. You would be surprised how many of these smart devices try to call home to run ads every 10-15s. I got myself a raspi and installed pihole it filters out the ads from DNS requests and blocks them all. Pretty good as its just plug in and forget.